Quality Dentistry // Dedication to the Art and Technology of Dental Care. 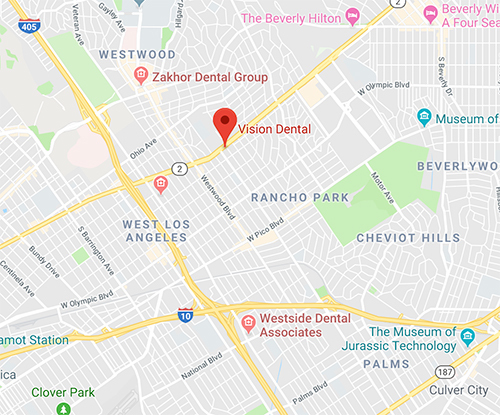 At Vision Dental West Los Angeles (Near UCLA , Beverly Hills and Century City), we focus on providing patients with a unique dental experience. We place an emphasis in patient comfort, while practicing the highest quality of dentistry. Our goal is to listen to our patients and complete dental treatment that is focused on their personal goals. We are a dental group passionate about the art and technology of dentistry and are constantly revising our techniques based on published literature. We offer complimentary street level parking. Entrance is off Little Santa Monica Blvd, located to the east of our building. We have an office in North Santa Monica on Montana Ave!! Think of it as an extension of our current office, 3 miles away.